As you might've seen me talk about before, I'm a member of the Hip Hop Caucus Charlotte Leadership Committee (HHC has leadership committees in 14 cities around the country). Through that involvement I'm helping organize an event this Saturday in partnership with UNC Charlotte Center City. It should be a great time, and you should come out. See details below. E Pluribus Unum Opening Reception with Respect My Vote! Saturday, September 15, 6-10 p.m. | UNC Charlotte Center City, 320 E. 9th St.
E Pluribus Unum, Latin for “out of many, one,” is the title of an exciting new art exhibit at UNC Charlotte Center City that explores the experience of pluralism in America, conveying the concept that diverse traditions, perspectives, and philosophies add value to the whole. UNC Charlotte has partnered with the Hip Hop Caucus’ Respect My Vote! initiative to host an interactive Opening Reception on Saturday, September 15 at 6 p.m. at UNC Charlotte Center City (320 E. 9th Street), free and open to the public. The evening will feature performances by Mike from Day 26, Bettie Grind, and Mr. 704, along with spoken word by Quentin "Q" Talley in front of a melting ice sculpture depicting the Middle Class. 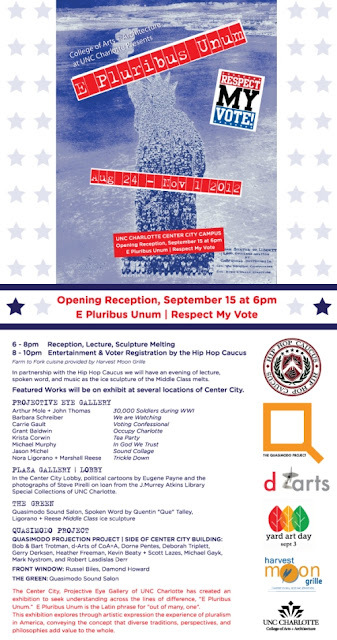 A live digital lounge will be set up for attendees to discuss E Pluribus Unum pieces, enabling them to post messages and images to Twitter, Facebook, and Instagram, using the #RespectMyVote and #EPluribus hashtags. A photo booth by Favors in a Flash will allow guests to take home complimentary photo keepsakes. Plus, complimentary wine and farm-to-fork cuisine provided by Harvest Moon Grille will be served during the first two hours of the evening. E Pluribus Unum, presented by the College of Arts + Architecture and located at UNC Charlotte Center City, is a gathering of different cultures and expressions, including works by Michael Murphy of Georgia; the collaborative team Nora Ligorano and Marshall Reese of New York; historical artists Arthur Mole and John Thomas; and Charlotte-based artists Barbara Schreiber, Grant Baldwin, Carrie Gault, and Jason Michel.